Formulated with hyaluronic spheres to ensure comfortable wear on all skin types, Make Up For Ever's Ultra HD Liquid Foundation creates a naturally flawless complexion - on and off camera. Completely invisible under the latest, super-focused 4k lens, this foundation features uniquely-coated pigments that provide medium to buildable coverage with a lightweight, second-skin texture that looks just like skin. First and foremost, this shade (Y315) is the perfect match. I have used Make Up For Ever's Ultra HD Foundation for over two years and although the liquid foundation is great, I definitely consider the Ultra HD stick foundation one of my favourites. 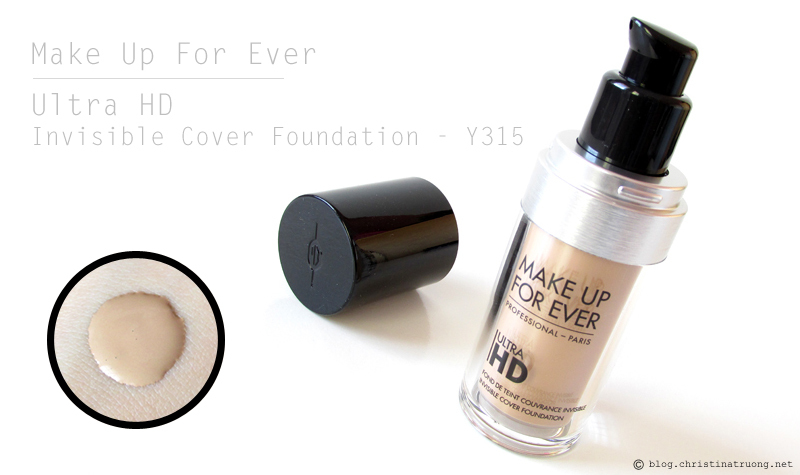 The Ultra HD Foundation provides a medium coverage that can be buildable. Its matte finish is great if you want a mattifying look. It evened out my skin tone and provided a flawless outcome. Maybe it's just me but the one flaw I have about the Ultra HD Foundation is that the foundation does transfer when setting spray/powder is not in use. And because it's a matte finish, I wouldn't recommend this to someone who has dry skin, unless you use a super hydrating moisturizer or primer. Other than that, I do love the Ultra HD Foundation when I want a medium coverage, matte finish - just as long as I set it with a setting spray. What are your thoughts on MAKE UP FOR EVER Ultra HD Foundation? Have you tried any of the Ultra HD line? What's your preferred foundation coverage?